This article explains how to schedule a quick meeting. Quick meetings are meetings on-the-fly, which you do without any advanced scheduling. Electa LMS provides teachers with a opportunity to invite students/teachers for a quick meeting immediately at the moment. If you need to schedule live sessions in advance please refer to the Session Scheduling Guide. Click the Quick Meeting icon in the quick access menu or click Class schedule in the main menu, then click on the Quick meeting button. Create Quick Meeting window will pop up, choose Room from dropdown list and the meeting Duration. For quick meetings we cannot specify topic and start time. Quick meetings start immediately. Click Apply to finish this part of the action. A new window will pop out with the link to send to your attendees. You can copy the link and use your own email program to send the link to anyone who you want to invite. Please, pay attention to the notification Important! - how long the link will be valid for. You can invite attendees when your quick meeting is scheduled by clicking on the red option button and click on the Invite people option from the dropdown menu in the Class Schedule page. Send Email Invitation page will open. Or Click on Scheduled Quick meeting link on the Class Schedule page, when Event Details page is open click on the red option button and click on the Send E-mail option from the dropdown menu. Send Email Invitation page will open. 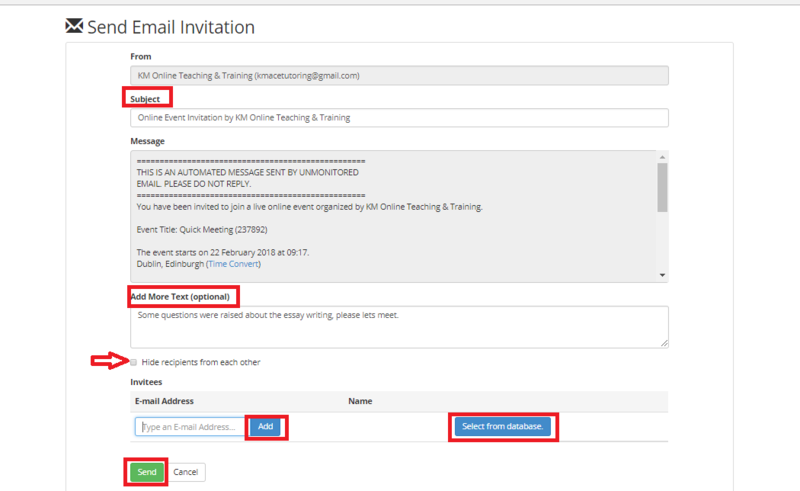 In the Send Email Invitation page you can add Subject of the meeting and optionally Add more text to the message. Under the field add more text by ticking on the box you can Hide recipients from each other. In the field Invitees there are two choices: type manually e-mail addresses of the attendees and click on the Add button or click on the Select from the database button and choose from the Select Users window attendees by clicking on the Select button in the row of your students/teachers. Close the window and click on the Send button to finish the action. Your selected users will get automated e-mail with the link to access scheduled quick meeting. 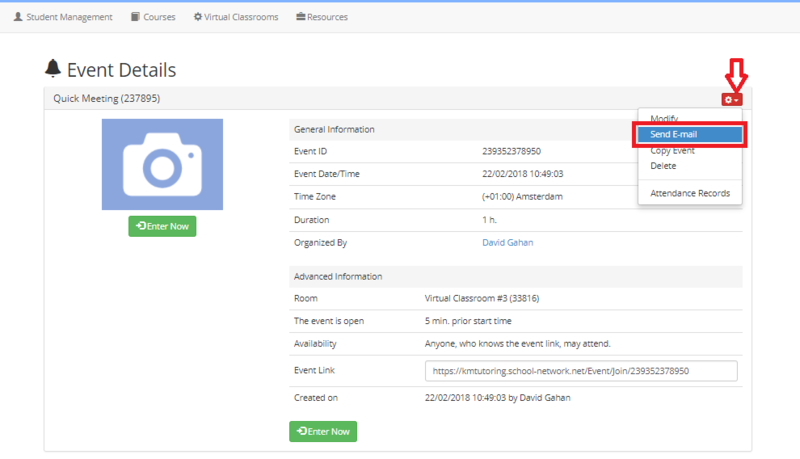 The teacher can enter the quick meeting by clicking on the Enter Now button on the Event Details page. The Quick meeting can be entered only for the period of the time that was predetermine by teacher and afterwards the link will be expired. Article has been viewed 968 times.